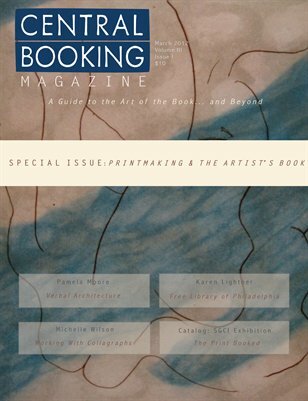 CENTRAL BOOKING Magazine begins its 3rd year of publication with a Special Issue exploring the relationship between printmaking and the artist’s book, in conjunction with the exhibition, "The Print Booked," part of SGCI's "Navigating Currents" in New Orleans, March 2012. Pamela Moore’s “od House” is an intimate look into the spaces created by her explorations into the concept of home. Karen Lighter shares her insights on the collecting philosophy at the Free Library of Philadelphia and Martha Hayden's poetic and political work meditates on the “Occupy” movements. The catalog for the Print Booked includes an essay by David Jones, who places the exhibition in the larger historical context of printmaking. Miriam Schaer writes about the evolution of her process, including her forays into digital printing as Art Hazelwood comments on the intersections of past and present in his work. All is rounded off by Editor Nina Pelaez’s musings on the influence of printing technology on the book - and where it may lead us.